Become a seasoned performer, conductor, or composer with our undergraduate music degree. 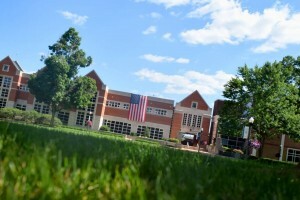 LVC’s B.A. in music degree is flexible and rigorous. It will allow you to go deep and focus your musical development in specific areas. The B.A. 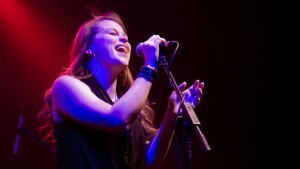 in music also is an ideal double major that can increase your career options. 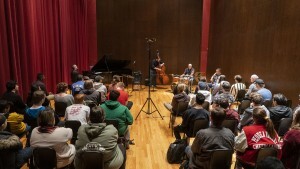 Explore you interest in composition, jazz, organ, piano, sacred music, theory, or instrumental and vocal performance through our major concentrations. Or create your own concentration with the guidance of a music faculty advisor. Develop a capstone experience in your senior year that could include a solo recital, research paper, or internship. You''ll be able to give your artistic decisions more depth with a background in performance, written theory, aural skills, music history, and composition. With 15 instrumental ensembles and three college choirs to choose from, you'll have plenty of opportunities to shine on stage, too. Want to do more than perfect your performance, on-stage and off? Pair your undergraduate music degree with one of our other majors to deepen your experience in Music Business, Music Education, or Audio & Music Production. 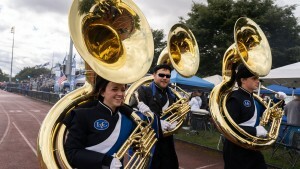 Or pursue a second major in a different area of interest, like Actuarial Science, Biology, Business Administration, Computer & Data Science, English, Environmental Science, or Physical Therapy to round out your experience in the liberal arts, all while performing with the Middle Atlantic Conference’s largest Marching Band, The Pride of The Valley. • Apply to our bachelor’s degree in music for first-year undergraduates and prepare your audition to join the department. • Master your degree requirements, from music theory to principles of conducting. • Concentrate your music B.A. in composition, theory, sacred music, organ, instrumental, voice, piano, or jazz—or design an individual concentration that explores your interest in contemporary music. • Pursue related degrees in Audio & Music Production, Music Business, and Music Education. You’ll get hands-on experience by performing each semester in one of our college ensembles. 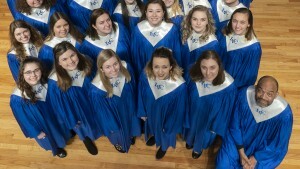 LVC students are welcome to join both choral and instrumental ensembles throughout their time at LVC. Collaborate with other vocalists in Chamber Choir, College Choir, or Concert Choir. Or audition for one of our instrumental ensembles, including groups for woodwinds, guitar, handbell, brass, or strings. Have lots of school spirit? Join the largest marching band in the Middle Atlantic Conference, The Pride of The Valley, to play for the Dutchmen and their fans. Take private lessons on the instrument of your choice in preparation for a senior capstone project. 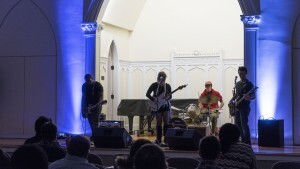 While most music majors perform solo recitals, we also encourage our students to experience alternative projects, from in-depth research papers and multimedia projects to internships that help you gain additional work experience. 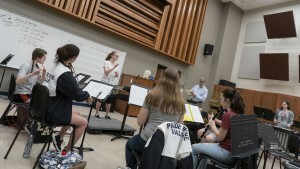 What Makes Studying Music at LVC Special? • Learn from our award-winning faculty, who are innovative performers and graduates of some of the finest music schools and conservatories in the country. • Perform in Blair Music Center, a premier music facility with a 500-seat concert hall, 32 teaching studios, 36 individual practice rooms, and four recording studios. • Connect with other student musicians in groups like the LVC American Guild of Organists, Valley Audio, National Association for Music Education, VALE Music Group, Phi Mu Alpha Sinfonia (music fraternity for men), and Sigma Alpha Iota (international music fraternity for women). • Our musical theatre minor creates an opportunity for students of any major to study acting, acting through song, general theater, musical theater history, and singing technique. • You can combine your love of music and business and pursue our minor in music business. Our bachelor’s degree in music is designed for students preparing to enter graduate school, teach private lessons, or serve in church ensembles, among other professional goals. We also support double majors who pursue an undergraduate music degree in addition to career and academic interests in areas like computer science, English, business, actuarial science, environmental science, biology, and physical therapy. Our strong network of alumni work in acoustics and building design, military bands, professional ensembles, recording studios, entertainment companies, and have even opened their own teaching studios. You’ll find them in managerial and support roles at organizations like Noisy Little Critter Recordings, Hershey Entertainment, and The Cutting Room Studios in New York City. 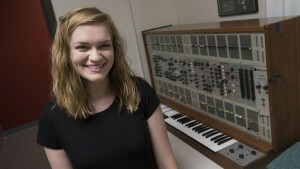 Other alumni have pursued graduate study in performance, conducting, and composition at the University of Florida, the University of North Carolina at Greensboro, and Binghamton University, among other institutions. 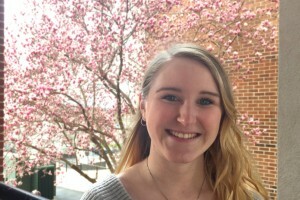 • Katie Hockenbury ’18 wins a Fulbright to study the historical manufacturers of the Welsh Triple Harp. • Justin Weilnau '13 earns degrees in music and science at LVC and today teaches music at a major university. I did an independent study on instrument repair at LVC, which allowed me to understand how instruments function and how small changes can affect their sound. It's the opportunities that you take advantage of that create your college experience. I feel I took full advantage of what LVC has to offer, and it has treated me well. Please join the students of LVC's music department as they perform a recital. This performance is free and open to the public. Retiring adjunct instructor Jim Erdman shares his experiences with the United States Marine Band.